For the past few days, I have taken some time to reflect upon the past year. It amazes me how every year goes so much faster than the one before. My parents always warned me that as you get older, the years go faster, but I was too naive to understand or appreciate their wisdom. I've decided to try and slow 2017 down to the best of my ability, but I suppose those efforts will prove fruitless as well. I didn't rejoin the blogosphere until November, so most of the year is not documented in any way. That means I have a lot to cover in this post. Do bear with me as I reminisce over the memories of 2016. They are in no particular order of importance, merely a download of what I recall. I had the amazing opportunity to attend the RNC. I was there the night that Ted Cruz, Newt Gingrich, Paul Ryan, and Mike Pence spoke. Donald Trump did make an appearance, but it was only brief. I was seated not too terribly far behind the entire Trump family. I only wish I could have gotten to meet Ivanka. Our family took a last minute vacation to Isle of Palms, SC in June. We have vacated here for the last several years and had hoped to change it up a bit this year, but vacay was booked on a whim so we stuck with what we knew. We had an amazing time, a much needed break. The boys loved both the ocean and the pool. Little J especially loved the waves and Little L was fearless. I vividly remember an episode of him jumping into the pool with our backs turned and without his swim vest on. It was a sight to see, I'm sure, when both my hubby and I jumped in after him. Our fellow pool neighbors joked about how we sure had our hands full with that one. We went to the Charleston Aquarium one day, and we had lots of great meals. We mostly didn't leave the condo though, and that's my favorite. We paid a visit to the Creation Museum while in Northern Kentucky for Little J's doctor's appointment with a Pediatric ENT. His pediatrician wanted to make sure that the tiny hole in his ear left over from a tube was nothing to be concerned about. Little J's hearing was perfectly normal and the hole should heal on it's own, praise the Lord! As for the Museum, I would have loved to have spent all day there. Little J enjoyed parts of it, but mostly it was over his head. He's a little too young to absorb all of the amazing information. I have all intentions of going back someday. He mostly enjoyed the Petting Zoo and taking a camel ride. We went to the Smoky Mountains for the first time in October. I am happy to say I have been, especially since it was just a few weeks before the awful fires. We took the Cade's Cove route in hopes of seeing a bear. No such luck. Though we did spot an elk on our return from Bryson City. Bryson City was probably our most memorable part of the trip. We made the two hour trek (only 30 miles mind you) to NC and boarded The Peanuts Express. We traveled to a local farm where Charlie Brown, Lucy, and Snoopy welcomed us to It's The Great Pumpkin, Charlie Brown Festival. There were inflatables, a pumpkin patch, games, snacks, crafts, and more. It was perfect. I loved the mountain views. Trips like that make me want to travel the US more. There is so much I haven't seen. Little J started participating in some sports. He played baseball in the spring, and started karate in the fall. He's currently playing basketball this winter. So far, baseball has been my favorite to watch. I think it's because of the weather - springtime, sunshine, and it's outside. I like the karate because of the discipline. Santa brought a punching bag for Christmas! Basketball is sort of painful at the moment. A bunch of 6 year olds trying to play the game is most definitely a work in progress. Little L had tubes put in his ears in June. They have worked wonders. Now, every time we have snot, we do not end up at the doctor's office with ear infections! Since, he is not the ideal patient, this is a good thing. I read a bunch. My absolute favorite for the year was The Nightingale by Kristin Hannah. I just noticed it's only $3.99 in the Kindle store right now, great deal! I shared all the books I read and my other favorites here. I had the best Mom's Day Out. Megan, my sister from another mother, and I live nearly five hours apart and never see each other. This year, we did the unthinkable and abandoned our families for one day. We met half way and spent the entire day shopping, talking, and eating. It was perfect. I'm not sure why we haven't done this before, but it is most certainly going to be done more often. I turned 33. I would count this birthday as one of the more forgettable ones. For some reason, I was in a funk. I think they call it the birthday blues? I really couldn't explain it because I know how ridiculously blessed I am. Thankfully, the funk didn't last long. I kept repeating to myself the verse that Joshua encourage himself in the Lord. I discovered there was a reason that I felt so tired all the time. I occasionally have heart palpitations, and anytime that I do, I call my family physician just to be safe. By the time I saw her, they had stopped, but I took the opportunity to mention that I was in a funk (this was around my birthday) and I just felt exhausted all the time. I assumed it was life - working full time, two kids, a husband, a farm, etc. but just to be sure, she did some blood work. And it turns out that I am anemic! My iron was well below normal levels, as was my Vitamin D. Thankfully, my thyroid panel was normal. (I have so many friends with thyroid issues and the thyroid seems so difficult to regulate.) I am now taking an iron supplement and vitamin D3 daily. My iron is still not where it should be, but it is improving. Little J turned 6. We had a bonfire birthday party, and it was perfect. He chose Hunting Camo for his decorations and his favorite present was his bike. He literally learned to ride it in one day. He was super excited. By the way, if I have it my way, all birthday shindigs will be held outside from now on. They are so much easier to clean up after! Little L turned 2. We celebrated his second birthday, outside in the garage, Mickey style. His favorite present was his riding John Deere tractor with a wagon. It was a bit of a rough start, but it was only a couple of days before he was zooming around the yard like a pro! Little J graduated preschool and started Kindergarten. Woah. I'm still slightly in shock that my baby has started the school years phase. Choosing public education or private education was one of the toughest decisions we've had to make thus far. We chose public, and so far, so good. He's thriving, reading basic sentences, and doing so much more math than I ever imagined. I am one proud Mama. Little L changed preschools. When Joe moved on to Kindergarten, we made the incredibly difficult decision to change daycares as well. It was just time. It took Little L a few weeks to adjust, but once he did, everything has been perfect. I am so thankful for the folks that take care of my baby while I'm working - his teachers are amazing. Farm life is the good life. I'm not sure my hubby would say the same, but it appears to have been a successful year on the farm front. We made lots of hay. Oh wait, did I say we? The hubby made lots of hay (300 round bales and 1500 square), moved 18 calves to the barn for me and the boys to feed when he's not home in time, and he killed a nice buck. We also purchased more acreage this year. The new ground is a much flatter piece. I made new friends. Most notably, dry shampoo. I have finally embraced the idea of not washing my hair every single day - huge time saver. I now only wash my hair every other day and occasionally can manage day 3 hair, but not often. I splurged on the iPhone 6S Plus. I hold my husband's SE and I'm like this is a baby phone. I love the bigger screen. Especially with all this blogging. The wet brush is the best thing ever invented. When I blow dry my hair, I now do not lose half of it to the brush! I started using the Flo Period Tracker app. I used to just jot down the days I started my girl time on a sticky note but this is amazing. I subscribe to The Skimm. I'm probably late to the party, but if you haven't heard of it, you should totally check it out. It's news delivered in small doses and with subtle puns. It truly helps keep me up to date, and I don't have to watch the news - which depresses me most of the time. TV at it's finest. 2016 brought the reunion of the beloved Gilmore Girls. I spent the day after Thanksgiving curled up in the recliner with my headphones in and feeling all nostalgic. You can read more about my thoughts on GG here and here. I am still faithful to NCIS and Scorpion. I'm hoping to add This Is Us and The Crown to my must watch list. I rejoined the blogosphere. Remember that funk I mentioned earlier? And Megan, my friend who lives forever away? 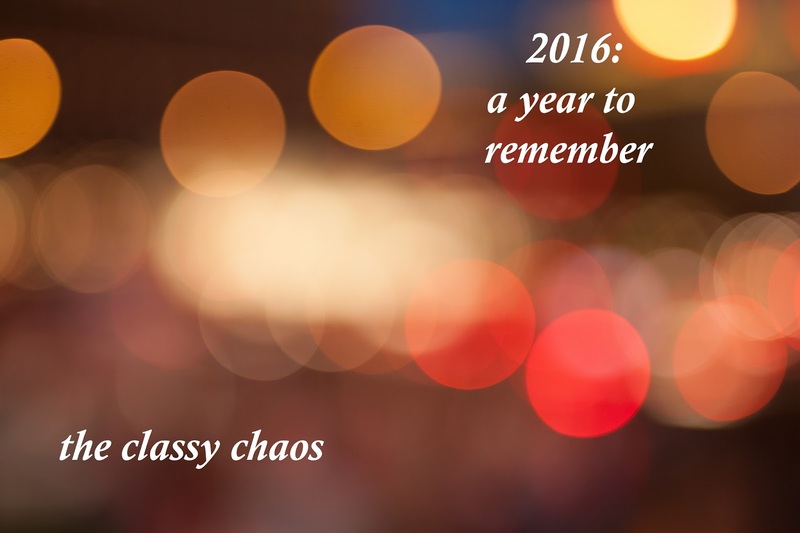 I had completely forgotten about the blog in all the chaos of 2016, and she suggested I start posting again. It has truly been amazing. I have loved getting back in the groove. The goal is balance. I burned out last time because I try to keep up with all of you awesome bloggers. I'm not awesome, I'm just mediocre and I've learned to be content with that. In my return to the blogging world, I joined Instagram and Twitter, plus I changed my design. I'm proud of this little space, and I really do learn so much from all of you. Well, that about sums up 2016. This year has been wonderful. God has blessed our family tremendously. He has taken care of me even though I've strayed so far from Him. And I am so very thankful for my family, my friends, our health, my work, our home, EVERYTHING. God is good. Thanks to each of you for supporting this little creative outlet and for keeping me encouraged to continue on. I wouldn't even know where to begin to recap the year but at least I have my boys monthly updates so that kind of was blogging the whole year...haha I am going to have to try that wet brush. Dry shampoo is the best thing ever for sure!! What a year Trista! So glad you had the day out with your friend and she encouraged you to start back blogging. I totally can relate to feeling mediocre next to so many other bloggers, but you are doing great!!! We can only do the best we can do😊. I've been anemic in the past too and hopefully you'll feel back up to speed quickly. I also figured out after hosting quite a few of the kids parties at home (which I was all about) that I was willing to pay to have them somewhere other than our house...so much easier.😜 We watched the GG reunion too...and now I'm going to have to read your thoughts on it and see if by chance we felt the same. Happy almost New Year!!! So much good stuff from 2016! I'm jealous you were at the RNC, meeting Ivanka would have been awesome!! The creation museum is on my list, it's only a couple of hours from me! So glad you enjoyed the Smoky Mountains. We are about 5 hours away and traveled there a ton as kids and loved it. I'm really anemic too and it's amazing how much it affects how you feel. Wet brushes are amazing and I'm so glad you had such a great year on the farm! Totally get what you mean about trying to slow 2017 down. I'm going to do my best to be intentional with my time and really enjoy it but I know it will fly by! What a great year. I get excited seeing all of the fun you have as your boys are a bit older than mine. So glad you found out you were anemic-not glad you are, but at least you were able to do something to start feeling normal again! I hope 2017 is a great year for you and your family! Wow, what a year! So many big things for your family! That's really neat that you got to go to the RNC. I watched the whole thing on TV and even that was exciting, being there in person must have been such a cool experience! I too made the dry shampoo friend this year! I definitely can't go three days without washing my hair, but I really wish I could.Your 2016 looks like it was full of fun things. Welcome back to blogging! And what a year it was!! I'm glad to have met you through your blog and can't wait to see what 2017 holds in store for you, the blog, and your family!